Find me here now. Ta-da! the end of this blog. It's been so fun writing and posting and I've been so inspired by other bloggers. But, all good things must come to an end. My life has become busier and busier and I no longer have the type of job that allows me the flexibility to post and read throughout the day. That leaves the evenings and weekends to write, and truthfully, I've decided that time should be spent with my beloved Mr. DD, our precious new puppy and my darling girlfriends. To be honest, I haven't even read a blog in months. So- I'm quitting while I'm ahead and signing off here. Thanks for reading and commenting and following for the last 2 years. Thanks for the great ideas, the recipes and the fashion. Thanks for everything. Hope you all enjoyed the 4th! We went to Connecticut for some much needed R&R. We partied with a celebrity, ate like fat people, watched some amazing fireworks and and spent lots of time with our puppy. She is the most precious thing ever and I have to keep reminding myself not to treat her like a baby. Is that weird? Introducing, the cutest, smartest, most precious puppy in the world.... LOLA!! She's pretty much consuming all of my time, energy and attention at the moment, especially since Mr. DD has been out of town since the morning after we brought her home. She's precious and I adore her. And the moral of the story is this: enough whining/begging/pleading and your husband can be convinced of anything. 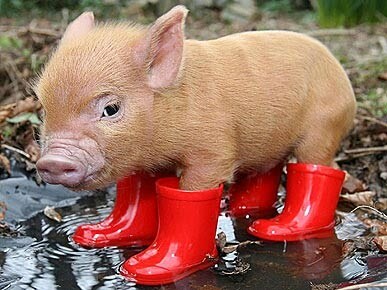 But this photo has me wondering if perhaps I would be better suited for a tiny pig in rainboots. "Miniature pigs are sold only as pets, and therefore we know that, as all pets are, they will be played with … its important that nothing particularly worries them or gets stressful." I hope everyone had a lovely weekend. I certainly did. I went to spinning, I went to yoga, I purged and reorganized my closet and donated 4 trash bags full of clothes and I had 2 (count 'em, TWO) dates with my husband. Oh, and we learned to shuck our own oysters! Our oyster habit was getting a bit out of control, so we headed to my favorite place on earth, Chelsea Market, and bought a dozen oysters, gloves and a shucking knife. It takes a little bit of practice, but they were so worth it. Another debilitating habit that I've developed recently is juice. For those of you who are not New Yorkers, allow me to explain. There are delis on every corner of this city. In many of those delis there are juice counters where you can pick your veggies and have them juiced right before your eyes. As much as I love the juice, the neurotic side of me has always wondered how well the veggies were washed and I've felt uncomfortable about the fact that they are likely not organic. So, this weekend, I busted out my 10-year-old Braun juicer and went to town. Totally amazing. 2 carrots, swiss chard, 2 apples and a lemon. It's a good thing that I realized all of these cost saving DIY tricks this weekend, cause there's nothing like a good closet purge to make you recognize that you need more clothes and shoes. I am obsessed with So You Think You Can Dance. Really, truly, totally obsessed. The truth is, I sob every week as I watch (the guy with scoliosis, the twin brothers... the list goes on). Then I laugh hysterically as my husband tries to recreate the contemporary routines. Who knew you could be so moved by dance. Next to the performances, my favorite part of the show is Cat Deeley. Could she be any more adorable? I'm looking forward to an amazing season... and berating my parents for not putting me in dance classes. For sponsorship requests or general inquiries, contact me at diagnosisdeferred@gmail.com. I love hearing from you! 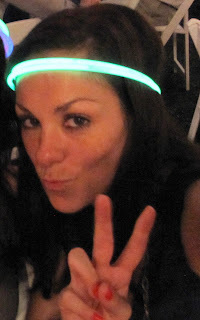 Recent reviews by Teresa G.
Follow me... all the cool kids are doing it!
. . . Quail Creative . . .
Order Business Cards, Brochures and Postcard Printing Online and Save!